The Naval technology research tree unlocks new ships and technologies related to naval invasions. It can be found between the land doctrine and naval doctrine tabs in the research interface. 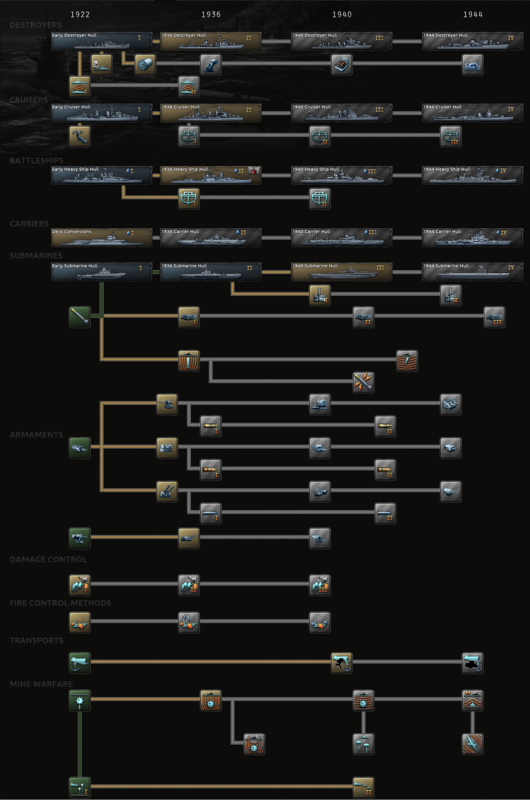 There are a total 31 different technologies within the naval tree: 28 ship classes organized into seven types and three naval transport technologies. Note that the first naval transport technology, Transport Ship, is required to execute naval invasions. Also note that a blue diamond on a ship's portrait indicates that it is a capital ship; capital ships are designed to sink enemy ships in surface battles and are capable of providing shore bombardment except for aircraft carriers which provide bombardment via their close air support (CAS) planes. The lightest screening vessel. Screens are very important because they defend the larger ships from enemy small ships that can carry torpedoes (torpedoes have a lower hit chance but when they hit they do a ton of damage on large ships). Destroyers are cheap screens that can evade large caliber fire, add anti-air capabilities, and let you detect and neutralize submarines. To ensure the safety of convoys, the destroyers of the Great War must be repurposed and developed. Arming vessels with more torpedoes will allow more opportunities to engage. Longer torpedo range and faster reload speeds, along with new types of armaments such as anti-air turrets, will allow our destroyers to remain efficient and versatile. To better face threats from above and below, new destroyers must be outfitted with radar and modern anti-air and anti-submarine weaponry. The modern destroyer must be fitted with a variety of different detection technologies, new depth charge deployment systems and be built at a larger scale than their predecessors. Light Cruiser - A light screening vessel. Cruisers are good at taking out other screens. Its primary duty is to shield capital ships from enemy light ships that carry torpedoes, but it can also unleash powerful torpedoes that are capable of hurting bigger ships if they get close enough. Heavy Cruiser - A large armored cruiser that is pretty flexible. A good choice for nations who can't afford to build larger capital ships. Heavy cruisers can take a lot of hits and carry a lot of firepower. Maneuverable light cruisers that can maintain a high speed will continue to be useful for scouting missions. Post-war treaties put restrictions on cruisers, but well-armed light vessels can be developed while remaining within these limits. Now skirting the limits of treaties, larger and more heavily armored cruisers can be built, still with light enough weaponry to be classified as light cruisers. Tactically employed to protect larger ships, the modern generation of light cruisers can shake off most past restrictions and be better armed to handle aerial attacks. The Washington Naval Treaty was set up to prevent an arms race in cruisers, among other ships, but this seems inevitable. By keeping armor light, the weapons load can be increased. Despite new efforts at treaties, refitting lighter cruisers with heavier weaponry remains efficient, although armor is still limited. As restrictions are increasingly ignored worldwide, more balanced heavy cruiser designs with more priority on armor can be built. Better anti-air guns allow these ships to cooperate in naval air warfare. Upscaled, longer and heavier designs with rapid-fire armaments are features in these final stages of heavy cruiser development. A large capital ship often with offensive abilities close to those of a battleship, but weaker armor traded for faster speed. Battlecrusiers can take a lot of hits and carry a lot of firepower. The post-war battlecruiser arms race resulted in several heavily armed designs, sacrificing armor for speed compared to battleships. Rebuilt and repurposed battlecruisers continue to outrun even modern battleship designs by lighter protection, but have developed better systems for fire control, detection and aerial defenses. The largest capital ship with the biggest guns and strongest armor that money can buy. Such an expensive investment deserves proper support of smaller screening ships. Battleships can take a lot of hits and carry a lot of firepower. Considered by some to be a relic of a bygone era of naval warfare, by others as the most impressive ships ever built, no one can deny that these remnants of the battleship arms race constitute some of the most heavily armed and armored vessels ever built. With improved stability and range, a new generation of battleships improve upon previous designs while remaining within limits stipulated by naval treaties. Thicker armor, stronger engines, a battery of high-caliber guns and improved anti-air capabilities can allow battleships to remain relevant, if correctly employed, in a world where naval warfare is increasingly dominated by aerial support. As the world sees what may be the last major battleship confrontations, the importance of heavy armaments and anti-air turrets is greater than ever. The current state of the world no longer has any room for abiding by naval treaties. Without these limitations, we can focus entirely on creating the heaviest, most well-armed battleships of all time, able to engage multiple lesser vessels. An improvement on our earlier super heavy design with stronger weapons and improved fire control systems. A capital ship able to carry wings of powerful carrier capable aircraft into battle. Also useful as a floating airfield you can position off the coast of your enemy. Many military theorists believe that naval aviation is the future. Converting old capital ships and ocean liners to carry aircraft will be the first step towards utilizing these new doctrines. As work begins on the first keel-up carrier designs, we must ensure that these ships have the range and speed to keep up with the rest of our navy, while respecting the post-war naval treaties. Improved construction methods and more specialized systems like deck edge elevators allow these carriers to transport more planes more efficiently. With many naval treaties now increasingly ignored, we can proceed to build carriers capable of transporting more planes than ever to secure air superiority cover. The role of the submarine is to hunt down enemy shipping and not have to challenge a superior enemy fleet directly to hurt them. Submarines employ stealth and powerful torpedoes to destroy enemy convoys. Submarines can also fill a role in regular fleet combat should the enemy be low on submarine detection. A submarine starts out hidden and is either spotted if it gets too close to a destroyer or after firing a torpedo after which it will try to escape. It won't be an effective weapon against an enemy with a proper fleet, but unescorted capital ships won't have much defense. Attacking convoys along an enemy trade route will deny them foreign resources. A nation split across the globe like Britain must convoy home resources to their capital area from many places in its empire to use them, making them vulnerable to submarine raiding. When receiving lend lease, convoys carrying equipment can be sunk and will be lost forever. When deploying troops on foreign theaters of war a nation must ferry supply and reinforcement equipment to them. By taking out these convoys their troops will be weaker and easier to defeat. Troops being transported or during a planned invasion may be attacked leading to them being wiped out or severely weakened. You always want to be very careful and guard your transport routes before sending troops somewhere in war time. Submarines are stealthy vessels designed to take out undefended convoys. The early models from the Great War pave the way for new methods of naval warfare. Better armed and more stable, new submarine designs are made to take advantage of advancements in naval tactics and have longer range, being able to attack distant convoy routes. The role of the submarine in the fleet outside of convoy attacks is still under debate. Achieving a balance between combination of speed, range and weaponry will be key to the necessary model. Increased test depth and efficient layouts will be features of the modern submarines, taking advantage of field experience to select appropriate armaments and engines. Ship designed solely for troop movement, without any defensive capabilities. Dedicated invasion craft make landing in hostile territory slightly less of a headache. Advanced Landing craft means that our boys can get on the beach quicker and more effectively during an invasion.